It is getting to be that time of year again. The ghosts and goblins are ready to come out and play. And this adorable paper plate flying ghost is more eager than the rest. Him and his friends are peeking out the window and they are just dying to create a little bit of spooky fun with you. This haunting craft is quick and easy to make and fun to play with. Read on further for supplies and directions… if you dare. Boooooooo! This craft is an ode to our pet betta fish Luna. It was not her birthday or anything, but my daughter insisted over weekend that we needed to make something to celebrate our Luna. So here it is!! 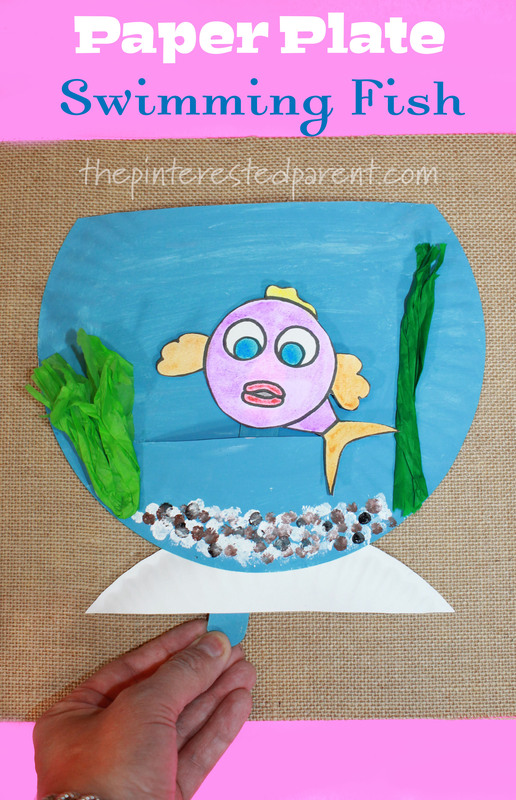 This cute and interactive paper plate swimming fish craft is dedicated to her. A free printable template is available for your convenience. We live in New England. It is not uncommon to be playing in the snow one day and then to be outside in shorts the next. The weather can be crazy and unpredictable. As much as we sometimes like to complain about the ever-changing weather, I would not change it for a thing. There is something to love about each season. My favorite is watching the trees. I love the gorgeous colors that the fall brings and the haunting beauty of a bare tree getting ready for the winter. Right now, we are excited to see the buds on the trees preparing to sprout for the spring. We love each and every season. Because of this, four season crafts are a favorite of ours. Here is a fun four season craft with a twist (literally). Who else is ready for the spring? I know that we are. If you are looking for a touch of spring to brighten up your day, this fluttering butterfly craft might be just what you are looking for. Your kids will love designing and making their butterflies and them watching them flutter and fly. A couple of days ago we made a paper plate ice skating craft. It was a huge hit with our audience, but an even bigger hit with my little girl. She couldn’t get enough of it. She loved making the skater move around the “ice”(paper plate). Almost as soon as we finished making it, she said “I know what we can do next. We need to make a skiing craft.” She was so excited about this that she could not wait, so together we brainstormed and came up with this adorable snowman skier. My five year old is an aspiring hockey star. She loves it on the ice and I love watching her. An old photo of her on skates inspired this paper plate ice skater craft. If you are looking for a cute and sweet winter project, don’t look any further. These adorable ice skaters are a fun winter craft with an interactive twist. Your kids will love coloring in the printable templates. They can add their own faces or draw in ones of their own design. There are not many things cuter than an adorable waddling penguin, except for maybe three adorable waddling penguins. These penguins look like they are waddling in this easy rocking paper plate penguin craft. Vampirina Mania has taken over our house. My daughter cannot get enough of that adorable little vampire. I have to admit, I like her too. It is such a cute cartoon about a little vampire girl just trying to find her place in the human world with a little help from her human and not-so-human friends. Our new favorite character inspired this vampire girl paper plate mask. Bats are our thing this Halloween. We made these fun Dixie cup bobble head bats a couple of weeks ago and we had so much fun watching them bobble and fly that we wanted more. This time around our bats are swinging and flying and looking lovely doing it. Hypnotize your friends with this simple paper plate craft. Here’s how we made this colorful and groovy paper plate spinning wheel.